Hundreds of miles from everywhere, our gifts to each other are in kindnesses. It’s not that we are not kind on other days. Today is about extra kindness and extra effort. I really appreciate Jack. He is an amazing person. He is kind and generous and funny, of course. But what I appreciate most about him is how he always tries to leave a place better than he found it. The word “place” is literal and figurative. If we rent a cabin, it will be a little cleaner than we found it. If it is a relationship, it’s always better after Jack has been involved. My gift to him is biscotti. I thought of biscotti today because it takes extra time and effort. I wanted a complex blend of flavors and thought of cranberry, orange and almond. A carefully zested orange was juiced. The zest was cut into tiny pieces. The almonds were toasted in a pan with butter. Biscotti is labor intensive. It has to be baked in a loaf. Then cooled. Then baked again after it is cut into slices. Then baked once more to crisp the opposite side. My last touch is to drizzle it with a hint of white chocolate – just for looks. Every time the biscotti is baked or turned or drizzled, I think of the kindness I am doing for my best friend. Happy Anniversary, Jack! Combine flour, baking powder and salt in a medium bowl. Stir. Mix together sugar, butter, eggs and almond syrup until well blended in another bowl. Stir in orange zest and orange juice. Mix in flour mixture. Then mix in almonds and cranberries. Divide dough in half. 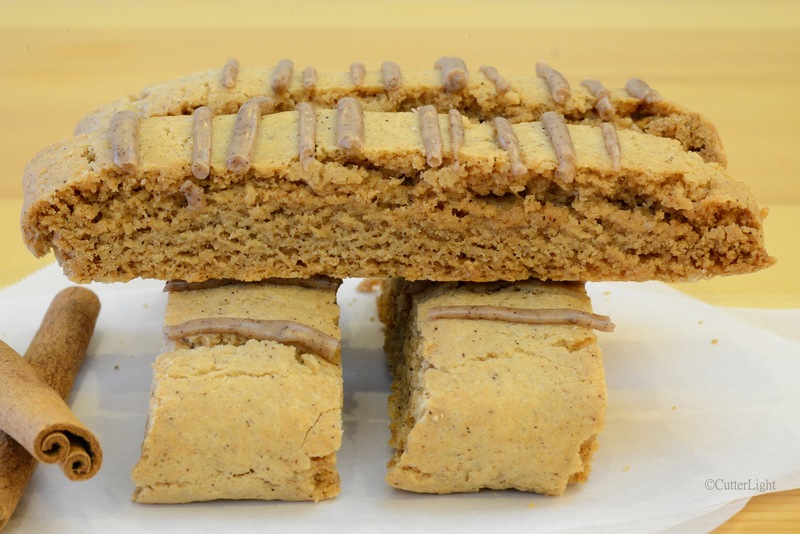 With floured hands, shape dough into two long logs on the parchment papered baking sheet. They should be about 2 1/2 inches wide, 9 1/2 inches long and 1 inch tall. Bake until golden brown, about 35 minutes. Cool until you can easily handle. Transfer to cutting board and cut logs into 1/2 inch wide slices. Discard parchment. Move slices back onto baking sheet, sliced side down. Bake for 10 minutes. Flip biscotti and bake for an additional 5 minutes. Biscotti should just start to color. Cool completely on cooling rack. 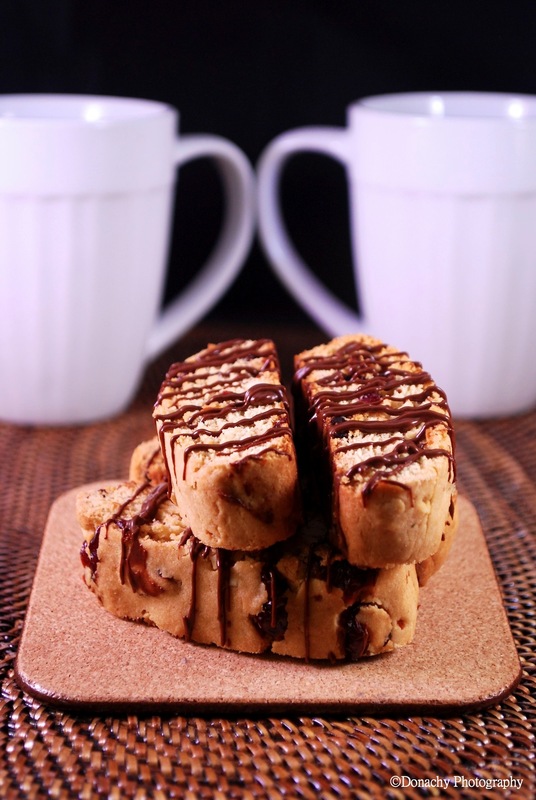 After biscotti is cool, drizzle with chocolate or dip for a finished look. 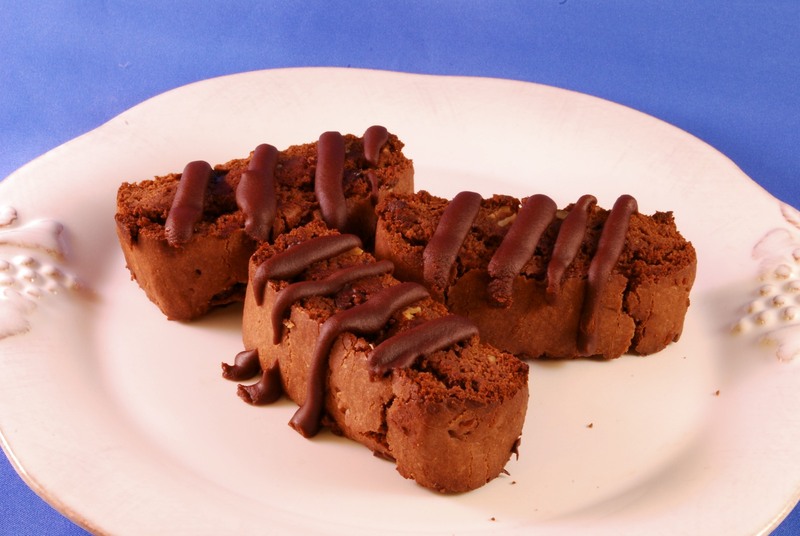 Of course, chocolate brownie biscotti. Just enough crunch to keep me interested. Devilish chocolatey taste to keep my sweet tooth happy. Baking three times took more time than the usual baked treat, but it was totally worth it. P.S. Jack says these were the best biscotti he’d ever had…ever!